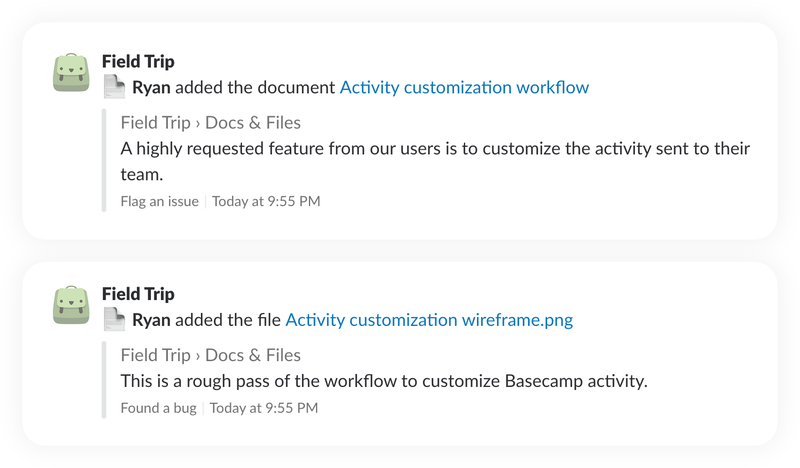 Field Trip now sends your Basecamp Docs & Files activity to Slack! When we originally released Field Trip, Docs & Files weren’t high on our priority list. Our team didn’t use the docs & files section often, so we put our energy into other areas. The number of requests we got to add docs & files support made it a no brainer to add as our next feature. Now when you add something new to Docs & Files, a notification is sent to Slack or Google Hangouts Chat. We’ll share your Basecamp activity with your team when you create new documents, upload files, or link cloud files from Dropbox, Google Drive, Box, or One Drive. Simple as that, Field Trip supports all your Doc & File needs. To find out all the types of Basecamp activity Field Trip supports, check out our FAQ. We’re continuing to add features and your suggestions help us find what we should be building next. So email us at hello@enjoyfieldtrip.com. We can start working on what’s next together!